For an Inside Mount: measure the width from bracket to bracket inside the window frame. 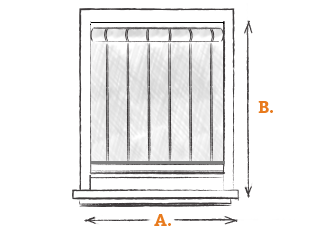 For an Outside Mount: measure the width from bracket to bracket on the window casing. Width less 1.375 inches must be less than the width of the chosen fabric. Measure the length from the top of the bracket to the bottom of the window (where the shade will end). This is the amount of extra fabric that should stay rolled up on the aluminum roller when the shade is pulled down completely (typically about 12” of fabric). If the roller shade includes a sleeve for the insertion of a bottom slat, add an allowance for the creation of that sleeve (typically 2 inches).